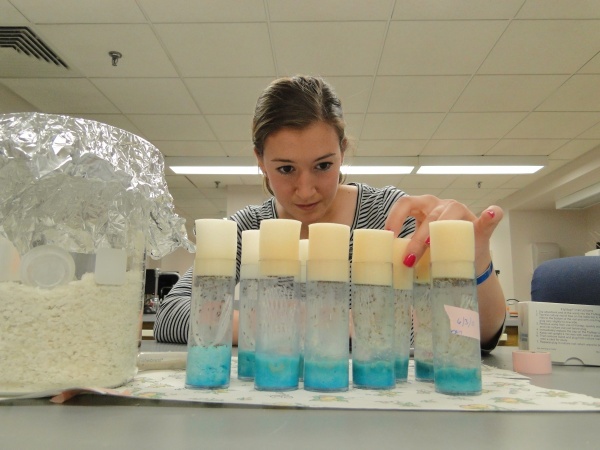 Allie Goldstein ’12 studied fruit fly respiratory physiology for her thesis. Biology is the study of living systems and how they interact with the nonliving world and with one another. It is a discipline that bridges the physical and social sciences. Students who major in biology become familiar with all levels of biological organization from molecules to ecosystems, and gain practical experience in both laboratory and field studies. More information on the biology department is available on the website (bates.edu/biology). Prospective majors are strongly encouraged to complete this two-course introductory chemistry sequence in the first year. CHEM 217-218. Organic Chemistry I and II/Lab. Organic Chemistry (CHEM 217-218) is strongly recommended for students interested in attending graduate school, and required for those planning to apply to medical school programs. a) BIO 190. Organismal Biology/Lab. BIO 242. Cellular and Molecular Biology/Lab. BIO 270. Ecology and Evolution/Lab. Majors are strongly encouraged to complete these courses by the end of the sophomore year; they must be completed prior to the beginning of the senior year. BIO 242 and 270 have prerequisites. BIO 470. Seminar and Research in Ecology. BIO 471. Seminar and Research in Experimental Botany/Lab. BIO 472. Seminar and Research in Physiology/Lab. BIO 473. Seminar and Research in Cell Biology. BIO 474. Seminar and Research in Marine Ecology/Lab. BIO 475. Seminar and Research in Environmental Toxicology/Lab. BIO 476. Seminar and Research in Evolutionary Biology. BIO 477. Seminar and Research in Microbiology/Lab. BIO 478. Seminar and Research in Molecular Genetics. BIO 479. Seminar and Reserach: Biology in the Community/Lab. NRSC 460. Capstone Seminar on Cellular Neuroscience, taken in the senior year, may substitute for BIO 460. Or, with prior approval, BIO 460 plus a community-engaged learning project. 3) Completion of the comprehensive assessment requirement. This requirement is fulfilled by completing a departmental comprehensive assessment during the senior year. Students may not major in biology and either biochemistry or neuroscience. Students may not major in biology and environmental studies if their environmental studies concentration is either Ecology and Economics of the Environment or Ecology and Earth Systems. Students planning to minor in chemistry may not use CHEM 321 or 322 toward both the chemistry minor and the biology major. Planning for the Major. Prospective majors are urged to discuss course selection and scheduling with a member of the department in the first year, particularly if participation in an off-campus study program is anticipated. It is essential to take CHEM 107 and CHEM 108 in the first year. The department strongly encourages students to complete the required core courses before the end of their sophomore year to allow scheduling flexibility later. Completion of the core courses prior to the beginning of the senior year is required. The department also strongly advises that electives be chosen in close consultation with faculty to ensure breadth of knowledge within biology (from molecules and cells to organisms and ecosystems). Students who study abroad may apply up to two courses toward the major as electives if the courses are appropriate and pre-approved by the chair. Pass/Fail Grading Option. Pass/fail grading may be elected for courses applied toward the major except for: BIO 190, 242, 270, and all 400-level courses. Advanced Placement. Advanced Placement (AP), A-Level, and International Baccalaureate (IB) credit does not count toward the major. It cannot substitute for any course in the department and does not reduce the number of courses required for the major.